Increase the desirability of Ultrabooks among a young audience by demonstrating not just what Intel makes, but what they make possible. Polar explorer Ben Saunders and his partner Tarka L’Herpiniere will attempt to be the first people to complete the 1800 mile return journey from the coast of Antarctica to the South Pole which British Royal Navy Captain Robert Scott famously attempted 1910-1912. The expedition will use Ultrabook devices powered by new 4th generation Intel processor technology to achieve unprecedented levels of communication, and record vital data from the Polar region, in temperatures of -45C. 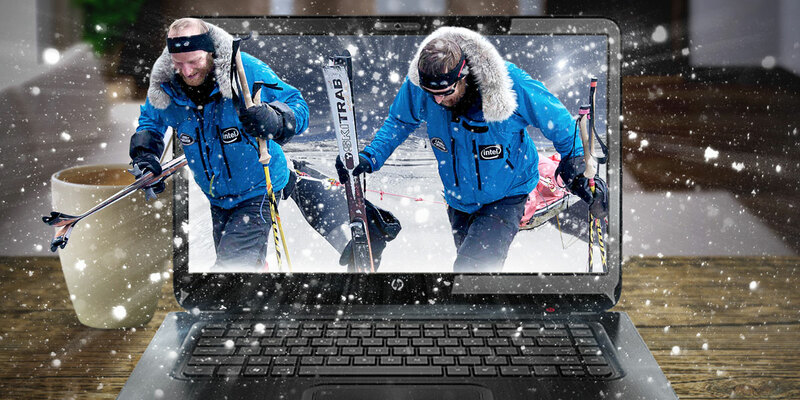 Build awareness for Intel’s new range of Ultrabooks to a younger audience by connecting them to the polar expedition. Establishing and maintaining the strategic direction of the project and overseeing all UX and Interaction Design activities. With a target audience who’ve grown up with technology, we couldn’t just tell them that Intel makes a difference in performance, we had to show them. In order to reach the audience in a way they would understand and engage with, we had to speak social. Ben used an Ultrabook to broadcast his epic adventure from one of the most isolated places on earth, sharing it in real-time to a global audience. He was able to update Twitter, Facebook and blog content along the way, as well as upload video content to a dedicated Expedition YouTube channel. Fans could interact directly with Ben via these social channels as well as through an online hub. Ben’s journey was faithfully recreated in 360 degrees using GPS, topographic and weather data combined with content created whilst out on the ice to create an interactive journal, allowing the audience to relive the entire journey and follow in Saunders’ (and Scott’s) footsteps.